Five people have been taken to hospital and a further 21 injured after the roof of a bus was ripped off when it hit a railway bridge in north London. Firefighters rescued three people who were trapped on the top deck after the roof was torn off in the crash on St Loys Road, Tottenham. Emergency services were called at 04:05 BST. None of the injuries is believed to be life-threatening. 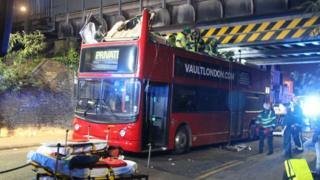 The vehicle appeared to be being used by a party bus company, Vault London. The company hires out double-decker buses for private events with on-board cocktail bars and DJ booths. No-one from Vault London was available for comment. Network Rail has declared the bridge safe, a spokesman for London Fire Brigade said. Scotland Yard said it was continuing to investigate the incident.